Best Screwdrivers For Mechanics: Only Top on The Market in 2019! 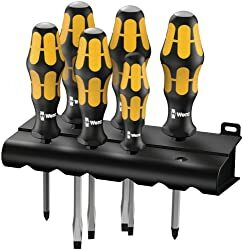 What features should screwdrivers have? Of course, you expect them to be firm, comfortable and not to be rubbed away so soon. Actually, they also should be different sizes and shapes and fit in a compact set. Well, I researched most of the popular kits, tried some of them and have discovered something really interesting for you. 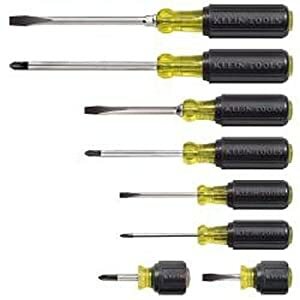 Below you may find Best screwdriver set review, where 5 common items are compared. Who hasn’t heard about Klein? It’s like Ford or McDonalds. It’s classic. And if you are interested in tools that have strong reputations and have passed the test of time, these are the choices for you. This compact set consists of the universal and widely used tools: 2 cabinet-tip, 2 keystone-tip and 4 Phillips-tip screwdrivers. There is also a plastic container, where you can keep the tools. Unfortunately, it is not very reliable. Klein Screwdrivers are made for general purpose. They can fit both mechanics and average customers. All the tools have tips, processed by a special machine in order to be super precise. They are also covered with chrome – that’s why the screwdrivers are so smooth-feeling and corrosion-resistant. This product is supplied with tip identification, so you will be able to determine screwdriver type and tip orientation easily and quickly. First of all I want to say, that this set satisfies ASME/ANSI requirements. But what is more important for users, it offers outstanding comfort because of the soft grip handle. And thanks to built-in flanges you can be sure of the anti-twist blade’s job. This Wera model includes six screwdrivers: four slotted (9/64”, 5/32”, 7/32”, 9/32”) and two Phillips-like (Ph1, PH2). It comes with a high-quality stand so that you can place it somewhere in a garage without the necessity to waste time looking for a suitable size and tip. Here you may find pound-thru blades for extra toughness and powerful torque. You can also forget about rolling and gliding – even if your palms are wet, hexagon feature would prevent this. As for handle, it combines hard materials to provide fast hand re-positioning and soft zones to increase grip. Used to working with a screwdriver in one hand and with a hammer in another? No worries, these German-engineered super durable tools are able to resist blade and handle splintering, so you may struck with a hammer as heavily as you’d like to. According to the manufacturer’s description, the Craftsman Extreme Grip platform was designed to provide better fit and grip. And it seems to be true. When I was working with the screwdrivers, they demonstrated loosening and tightening. At the same time, the starting was a little bit faster and much easier than the completing. The set comes in a double-blister packaging. And it is quite comfortable to keep them there. 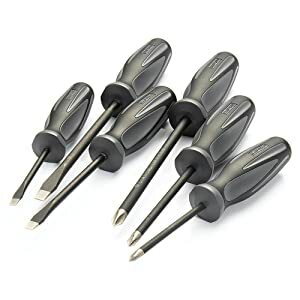 This Craftsmen series offers you six best brand screwdrivers for moderate use. The manufacturer decided to equip you with 3 slotted (3/16″ x 3″, 1/4″ x 4″ and 5/16″ x 6″) and 3 Phillips (#1 x 3″, #2 x 4″ and #3 x 6″) sizes. The tips of these babies are covered with diamond, so you will love them at first sight. They look brilliant! Shanks here are marked by laser, and you can easily identify what tool would be best for what. Can be used for home, car, bike, furniture screws. Unique coating provides great friction between screwdriver tip and fastener. Slippage and aids reduction is also guaranteed. As for the gripping rate, it is 4x more powerful in comparison with the standard screwdrivers. It can be the best screw bit set for professional mechanics. This GearWrench series offers you different tips and blade sizes (from 60mm to 8 inches), quality-made handles and quite good case. Having this set you may resolve any issue where screwdriver is needed. 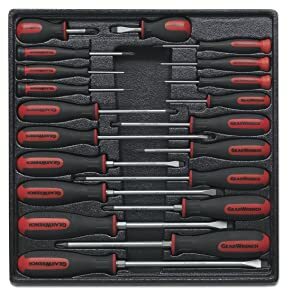 This master screwdriver set consists of 20 pieces. There are slotted, torx and Philips types, with cabinet tips and hex bolsters. On the shanks you may find size marking engraved by laser. The product comes in a plastic molded tray. It seems that the engineers from GearWrench have focused on handles. These guys used innovative dual material and made them tri-lobe ergonomic (this feature makes usage both powerful and comfortable). Each handle also has a so-called “speed zone” in order to provide fast turning in low torque ways with two or three fingers. As for the tips, they feature solvent and oil resistance. As you have read above, these tools provide fast turning in low torque places. They also help to get an expanded access and improved contact with fasteners due to black oxide non-slip tips. 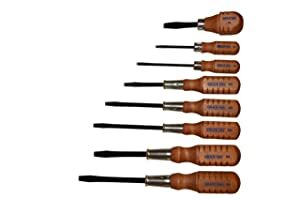 GRACE USA 8 Pc Original Gun Care Screwdriver Set is known by most Americans as the best gunsmithing screwdriver set. Remember a box that your grandpa used to open when his rifle needed to be repaired? That’s it! But a bit more modern. The set comes in a vinyl pouch. There you can find eight hollow ground, square shanked screwdrivers. According to the manufacturer description, they all are made from high-grade steel which is used for premium tools. And it feels exactly like that. Each screwdriver has a shanked blade hardened to R/C 52-56 and Rockwell standard. This excludes any twisting or chipping. All the tools are made with quality wooden handles which are delivered from Maine hardwood and fit any hand. GRACE USA provides a Forever Guarantee for this product. The sizes match all popular gun-smithing needs. They fit the gun slots properly and make turning easy. However, they can be also applied in some woodworking and Do It Yourself stuff. In a nutshell, the set provides quite comfortable and precise screwdriving. In a nutshell, the set provides quite comfortable and precise screwdriving. I hope this review will be useful for many mechanic beginners and DIYers. You should always remember that high-quality and durable tools make your work precise, comfortable and pleasant. Although all these sets are offered by well-known and respectful manufacturers, they can be applied within different areas of mechanics work. Also, you can pick the best cordless screwdriver and use it. And that’s why each of them have some points that can confuse. So it is highly recommended to compare advantages and disadvantages and to determine where the screwdrivers will be used.